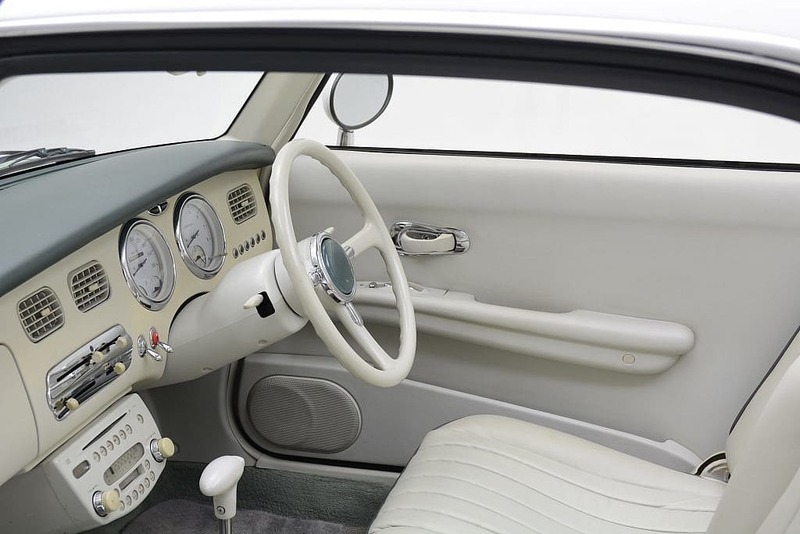 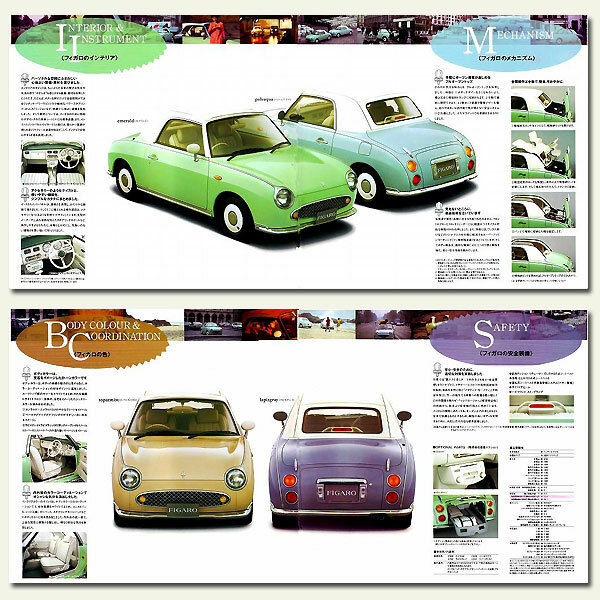 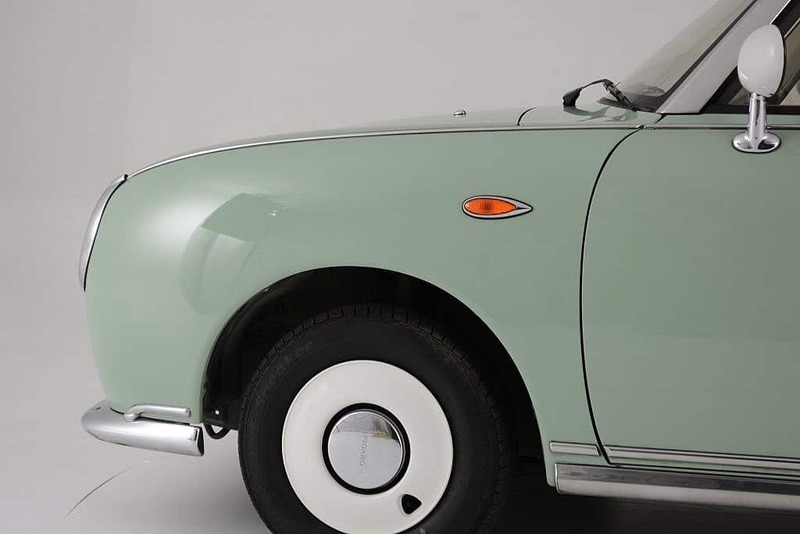 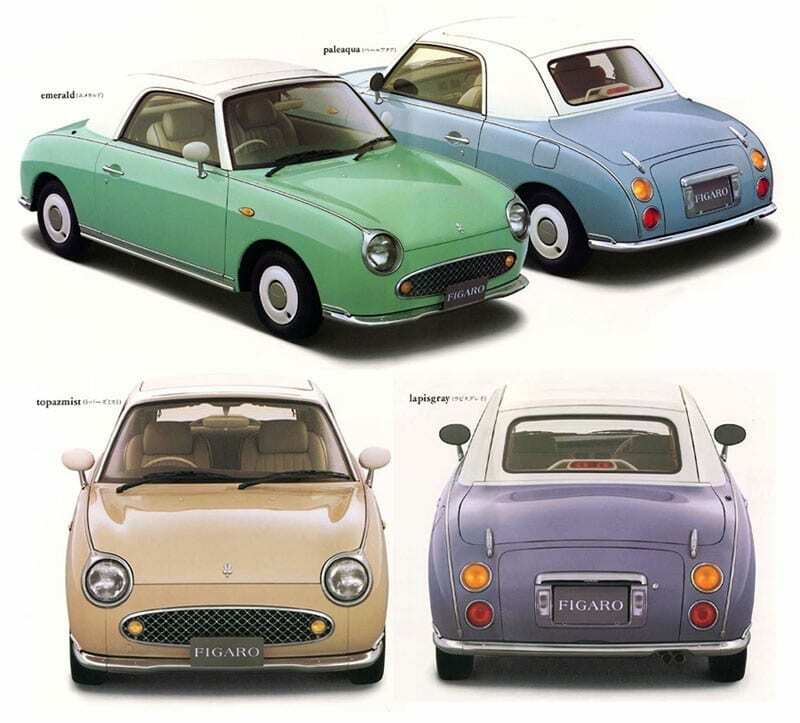 The Figaro prototype was launched at the 1989 Tokyo Motor Show under a “Back to the Future” banner as a 1950’s era throwback. 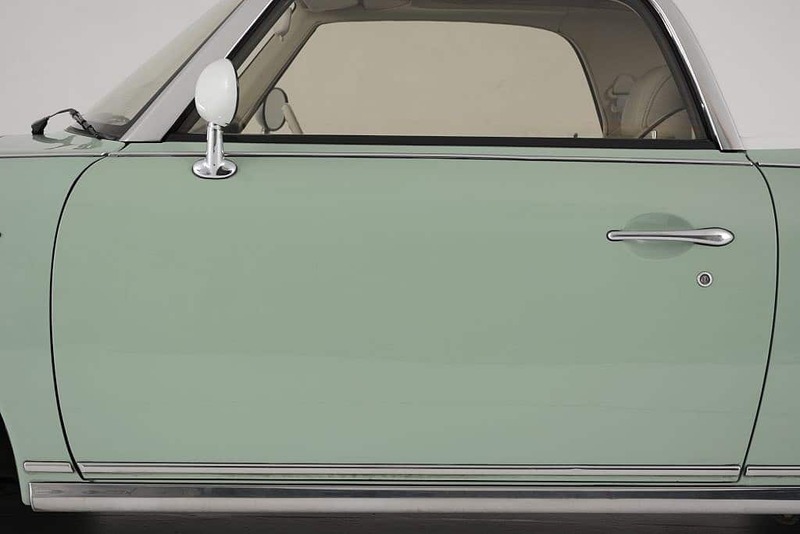 In near Henry Ford fashion, just four colors were available: Topaz Mist, Emerald Green, Pale Aqua and Lapis Grey as each color symbolized a season of the year. Only 20,000 units were ever built – 8000 planned with an additional 12,000 added to meet demand. 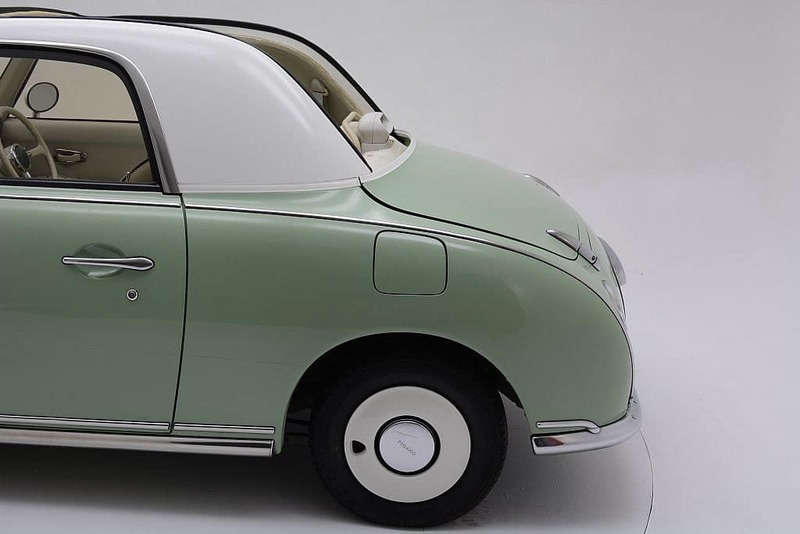 Despite the rather steep original MSRP of $14,500, they proved so popular that Nissan held a lottery to decide who could purchase one. 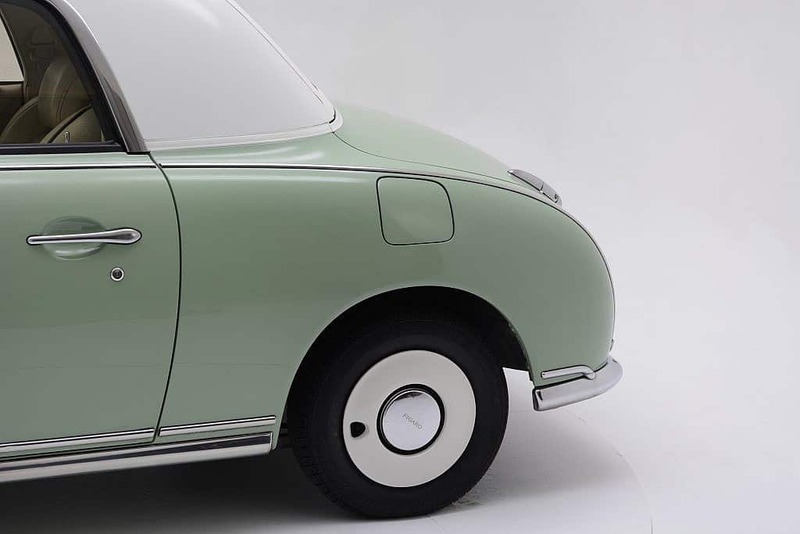 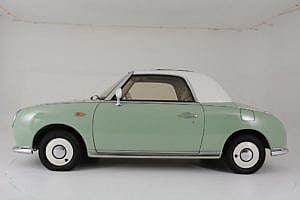 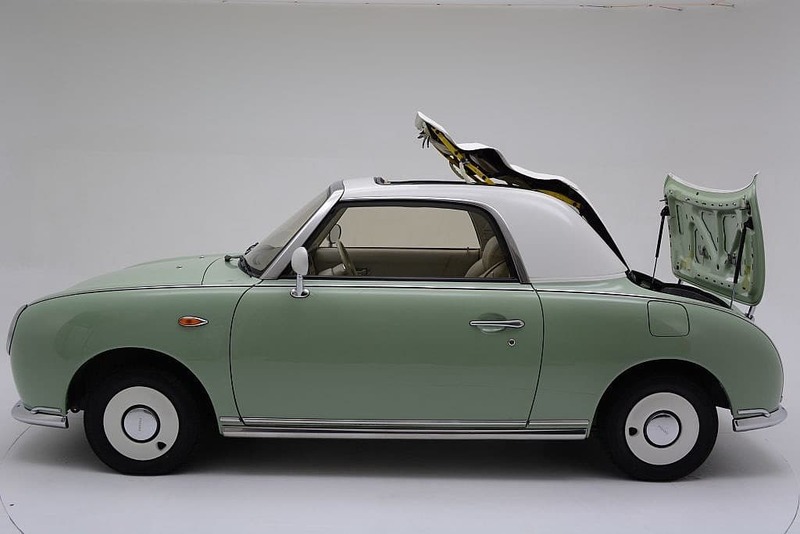 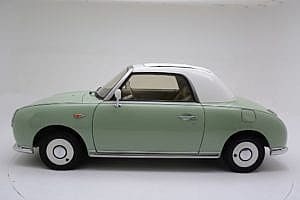 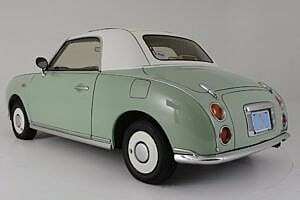 Designed by Shoji Takahashi and based on the Nissan March/Micra platform, the Figaro is small, like Geo Metro small, but is powered by a peppy little 987cc (1L) turbo 4-cylinder. 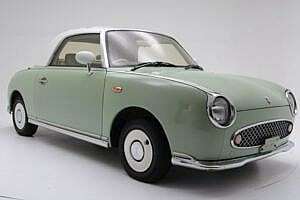 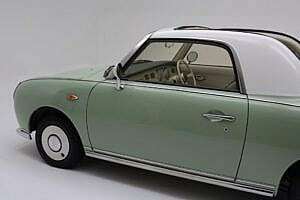 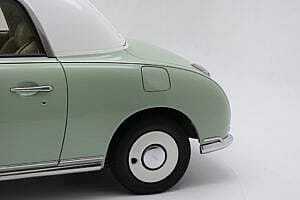 It resembles quite closely the Autobianchi Bianchina made in Italy from 1957 – 1970. 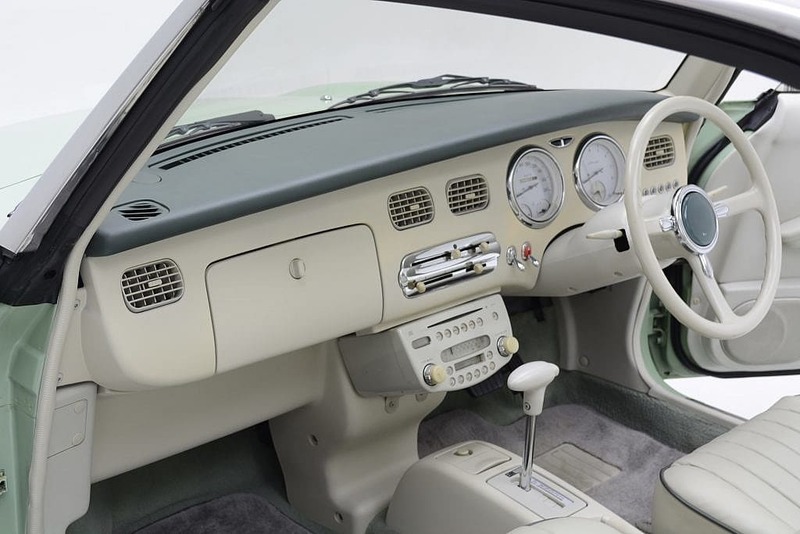 In accordance with your four color choices, you are given one transmission “option”, a 3-speed automatic and no other choices of interior. 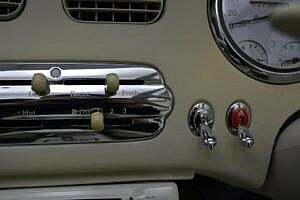 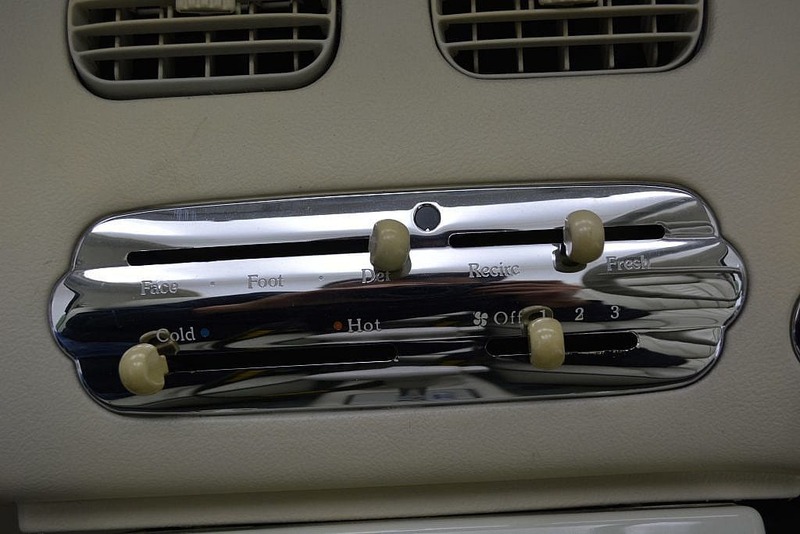 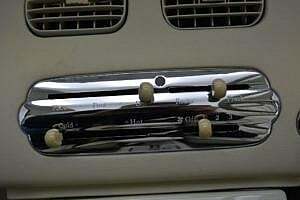 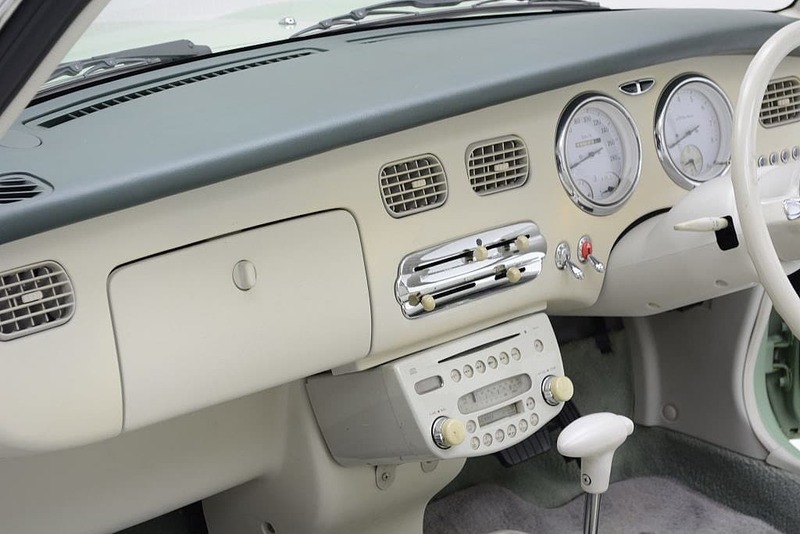 The inside is color-coded with white-faced instruments and retro-syled silver switches/knobs and a radio to match. Top Gear last year wrote “If a machine could be the manifestation of a good mood, this car would be it. 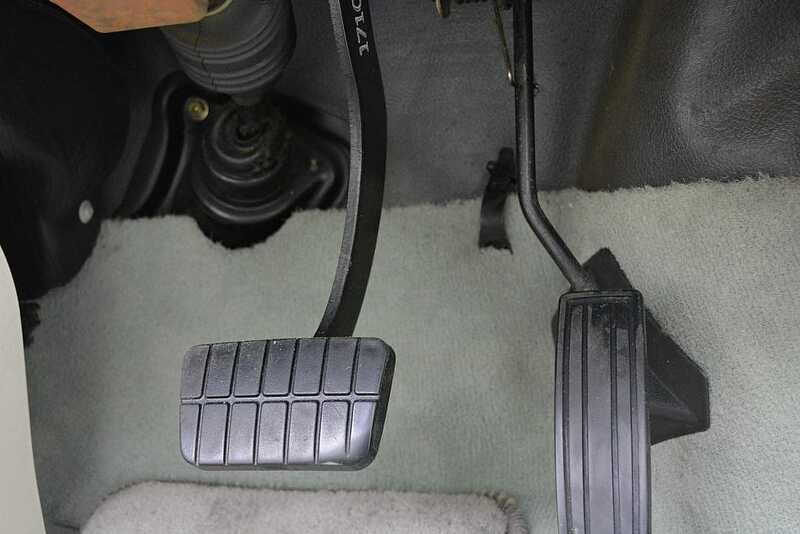 You cannot look at it without smiling. 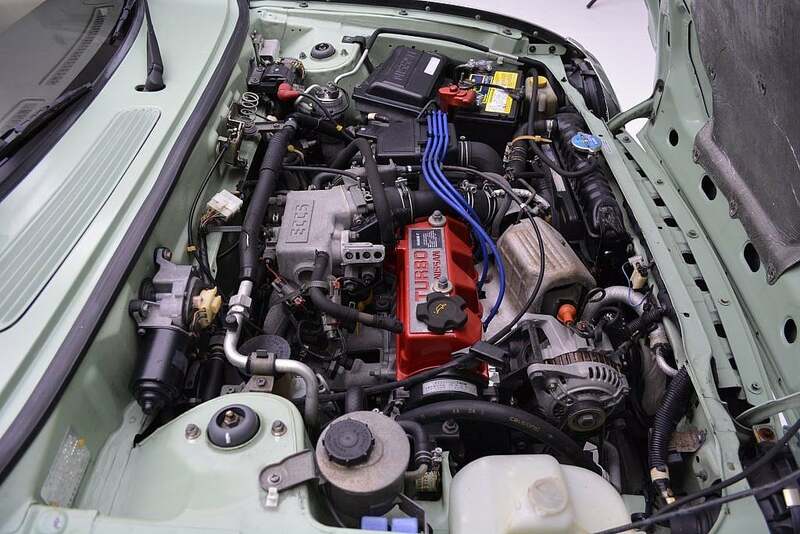 It has the appeal of a puppy!” We prefer one of our reader’s description … “it’s the automotive equivalent of a little boy wearing a baseball cap, chewing gum and yo-yo’ing”. 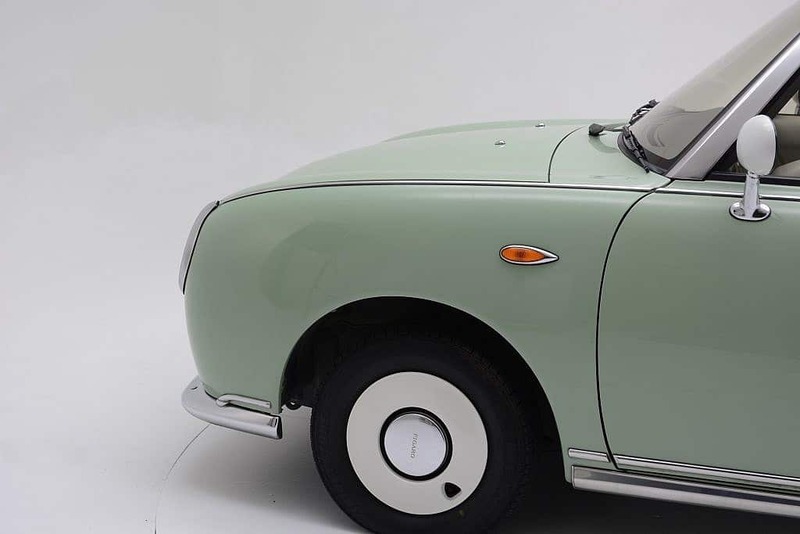 The general theme is there…having fun and always in a good mood! 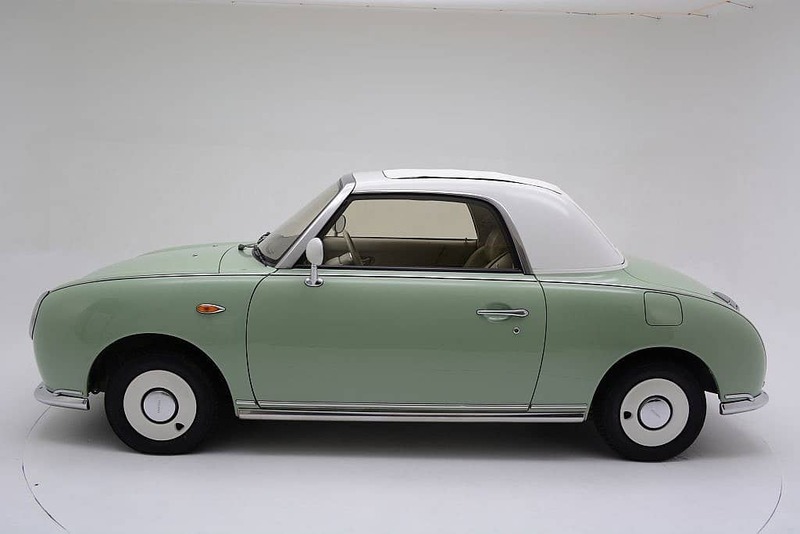 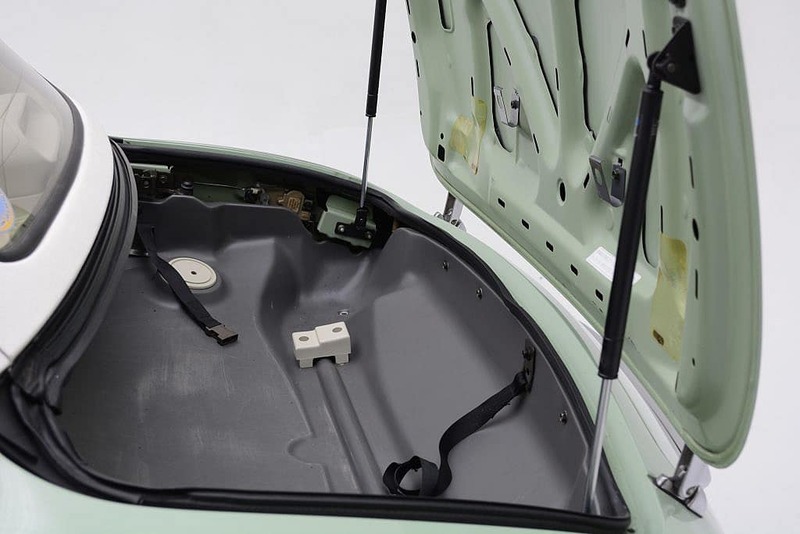 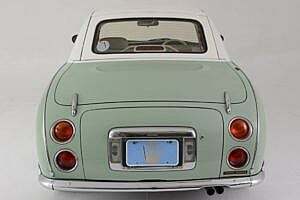 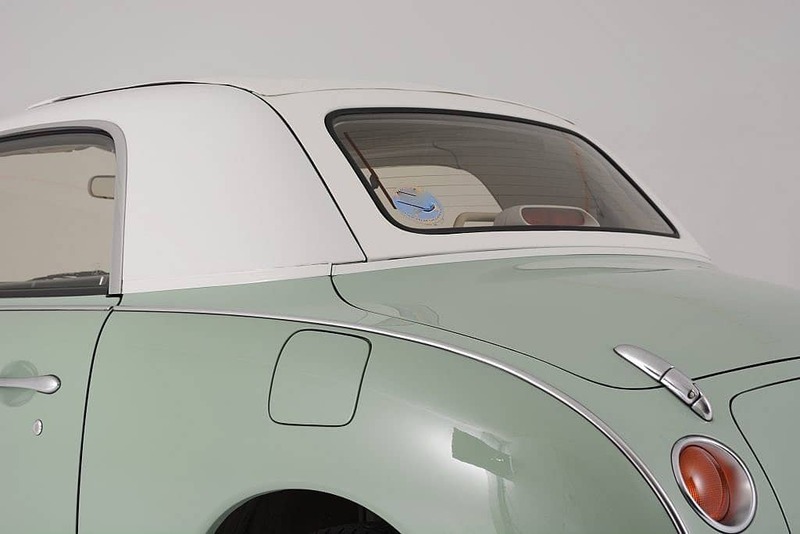 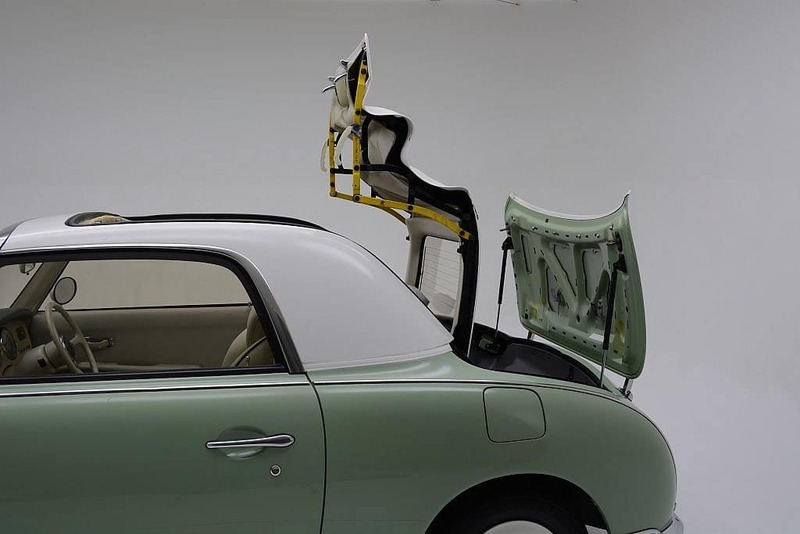 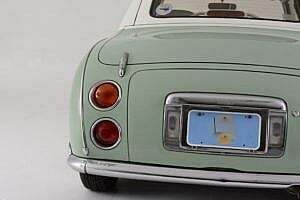 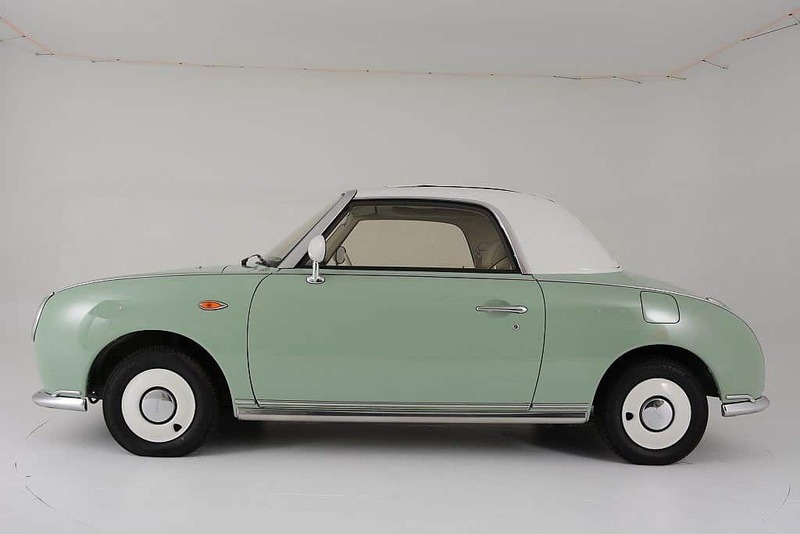 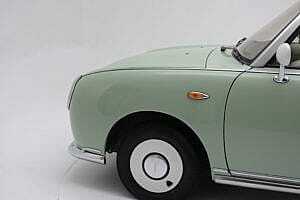 Today we are pleased to bring to auction this immaculately kept low mileage 1991 Nissan Figaro 2+2, finished in spring time Emerald Green with the factory fabric retractable soft top rounding out the fixed-profile convertible. 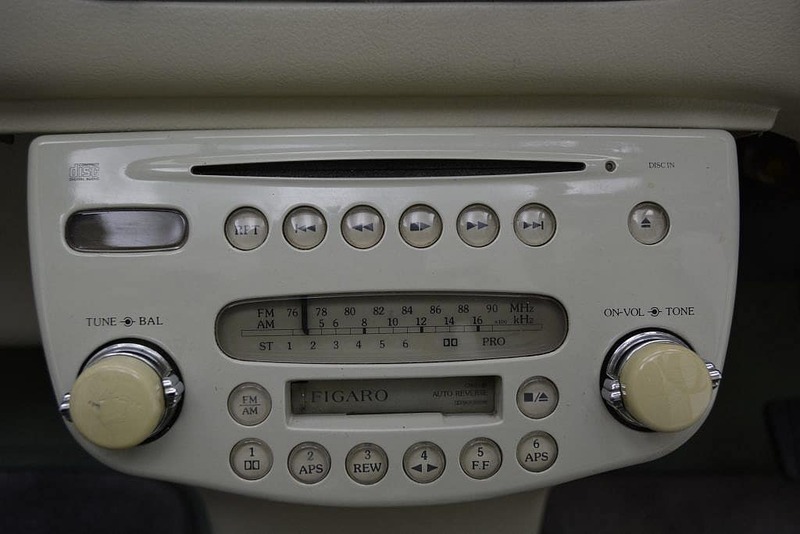 This Figaro has retained is originality through the only 39,615 miles ticked away on the odometer (63,755 kms showing on odo). 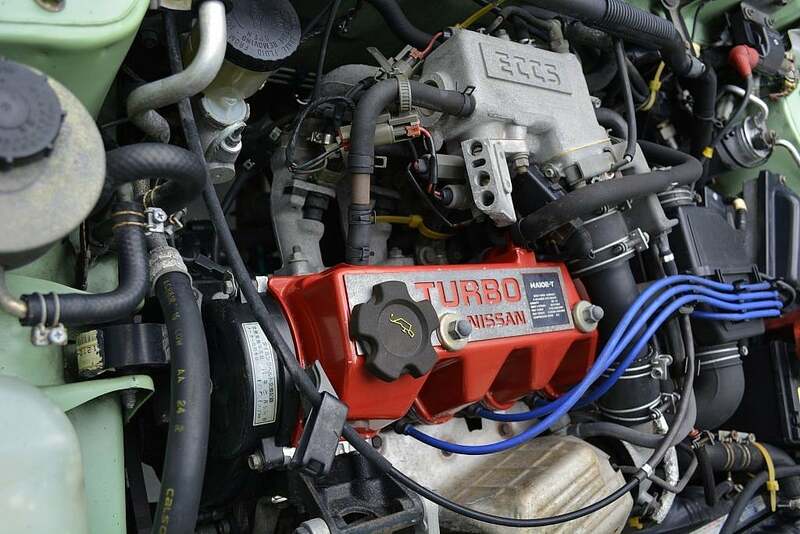 Recent services include a new timing belt, fresh oil change and fresh fluids. 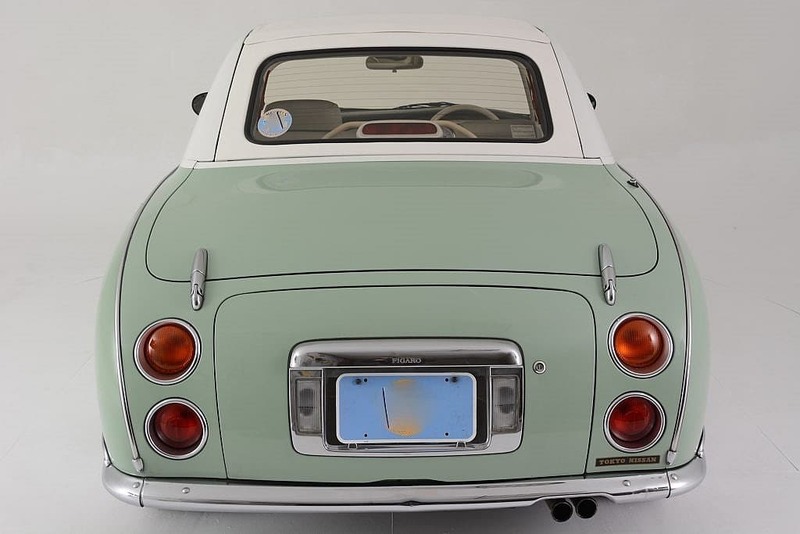 This car was imported from Japan and is completely legal and registered here in the states, and is being sold with a clean, clear Pennsylvania title. 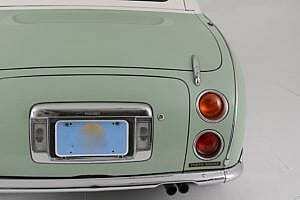 The original Emerald Green paint shows as new without any noticeable flaws or apologies. 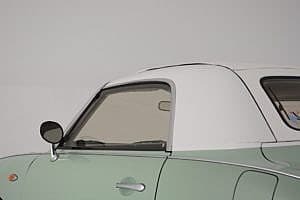 Any odd smudges or shadows you might see in the images are actual reflections of the photographer’s equipment in the photo room (that should give some indication how glossy the paint is). 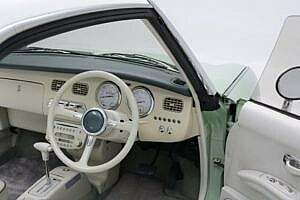 The paint and interior are factory original with the exception of the driver side door. 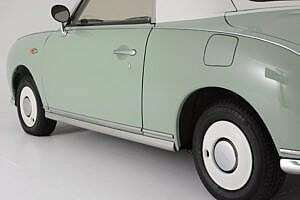 It was repainted after being scraped during transportation. 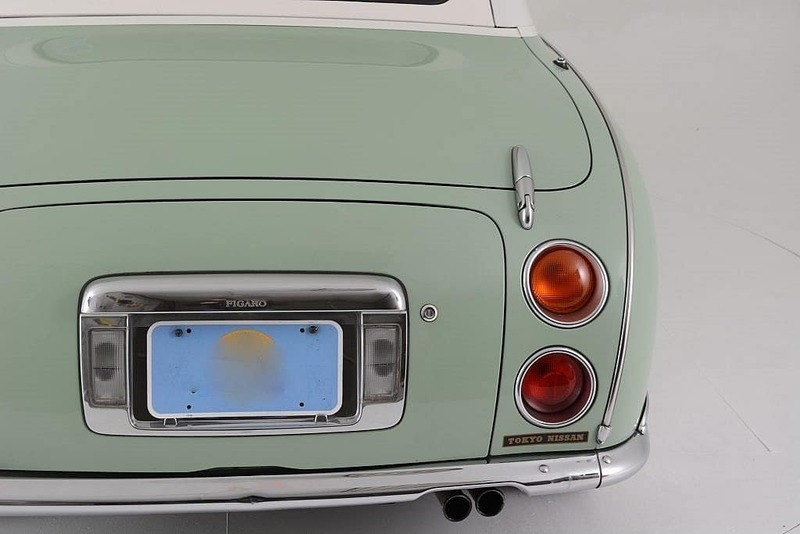 Seller states that it is a high quality repaint. 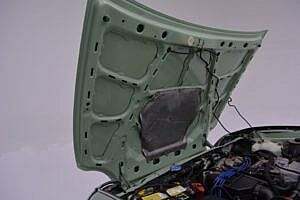 Other than that, the car has never been damaged, modified and is reportedly rust free. It is currently sitting on the original 12″ Figaro wheels and properly named Bridgestone “Sneakers”. All of the glass is reported original and shows no cracks or damage. 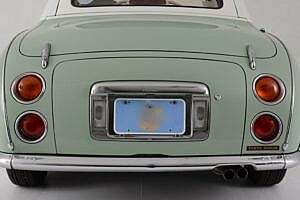 All panel gaps appear to be properly spaced, and the chrome looks to be in great shape. 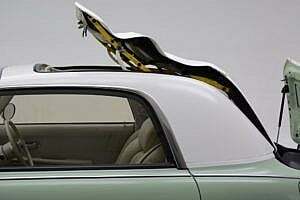 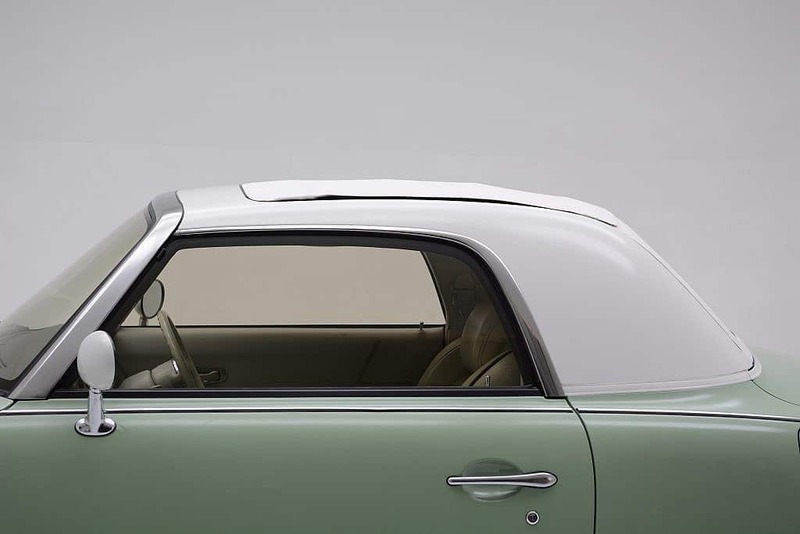 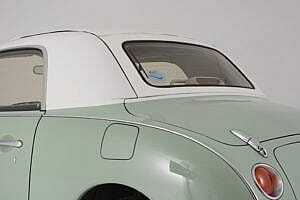 The fabric rag-top is positioned in the middle of the roof, not an actual full folding top, but rather a “fixed-profile convertible”. 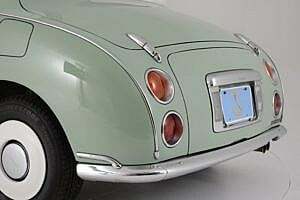 Think 1948 Citroën 2CV or the Fiat 500. It works without issue according to the seller, folding neatly into the rear trunk area to reveal the open centerpiece. 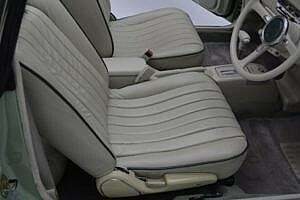 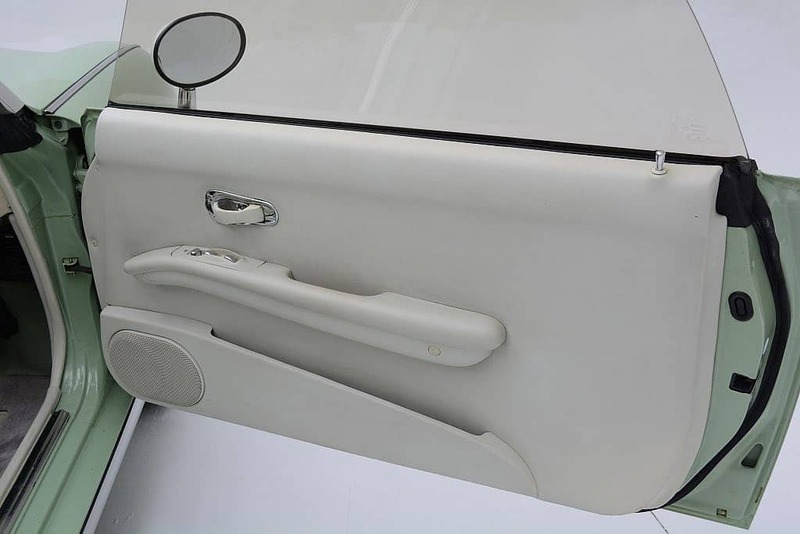 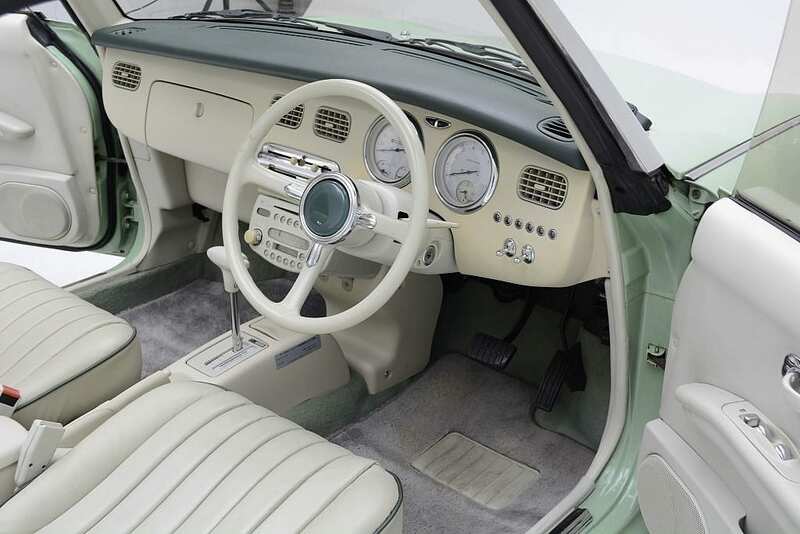 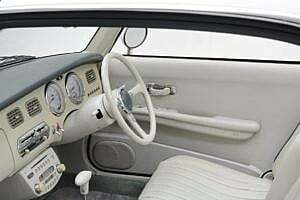 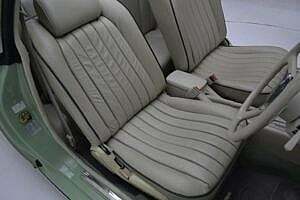 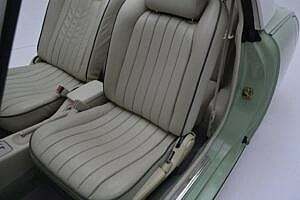 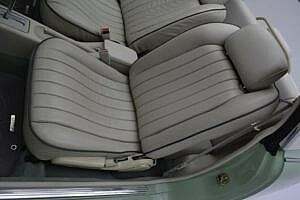 The retro-styled interior is a light matching white color that appears to be without issues. 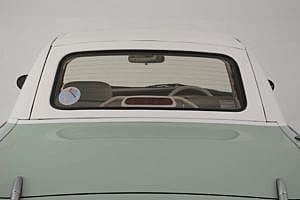 The only nit pick we can see is a small marking on the interior left / passenger side door. Given the interior color, it is amazing to not see any issues. 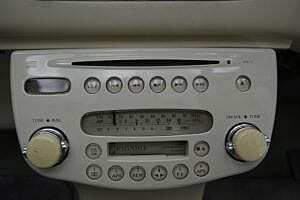 The radio / cassette player is fully functional in its pre-transistor styling. 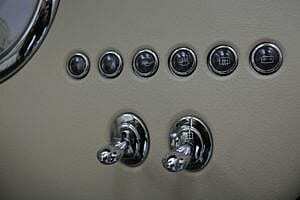 All the retro-chrome switches appear intact and everything is said to be in working order. All of the glass and gauges show very clear. 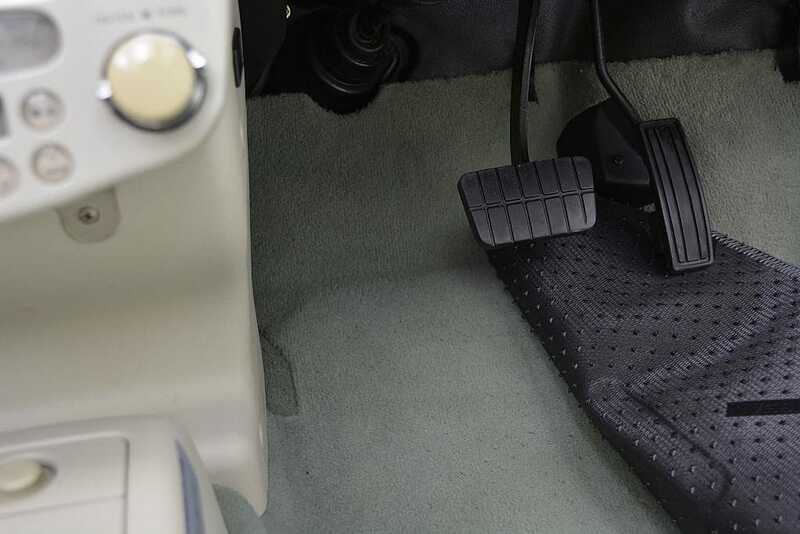 It is equipped with power steering and brakes, power windows, and air conditioning. 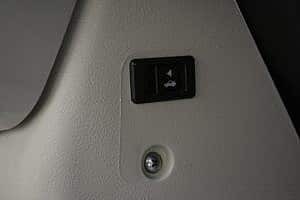 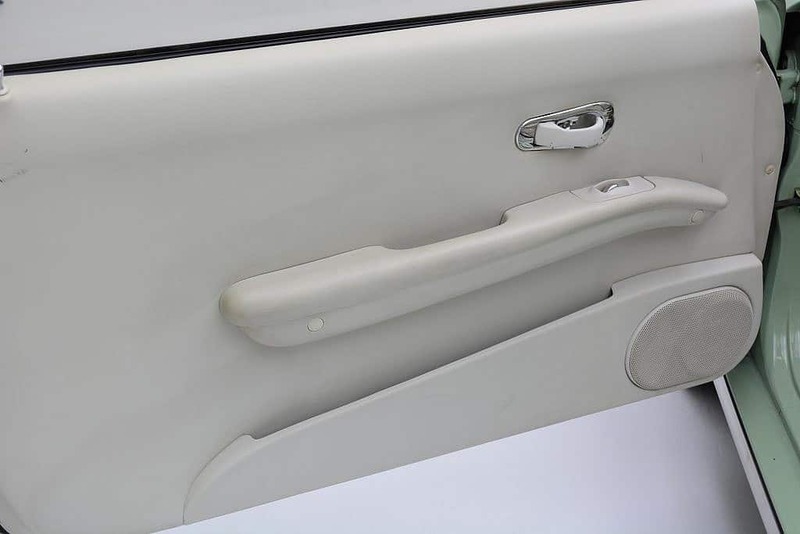 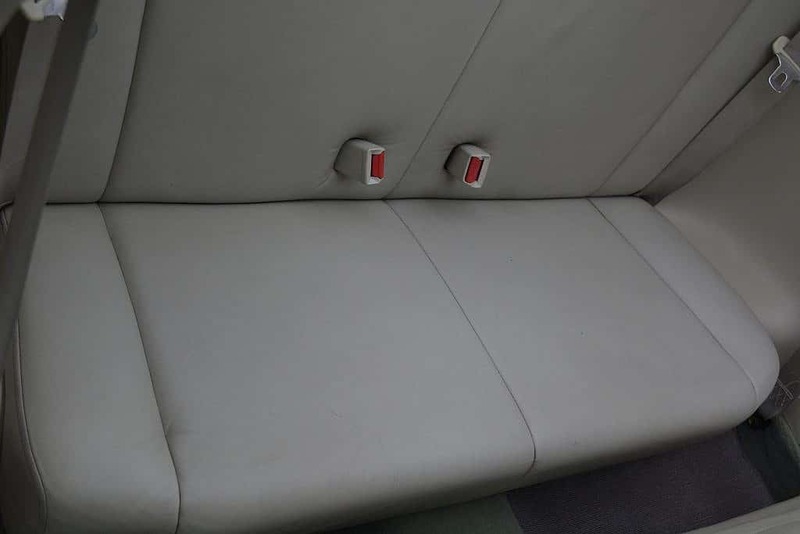 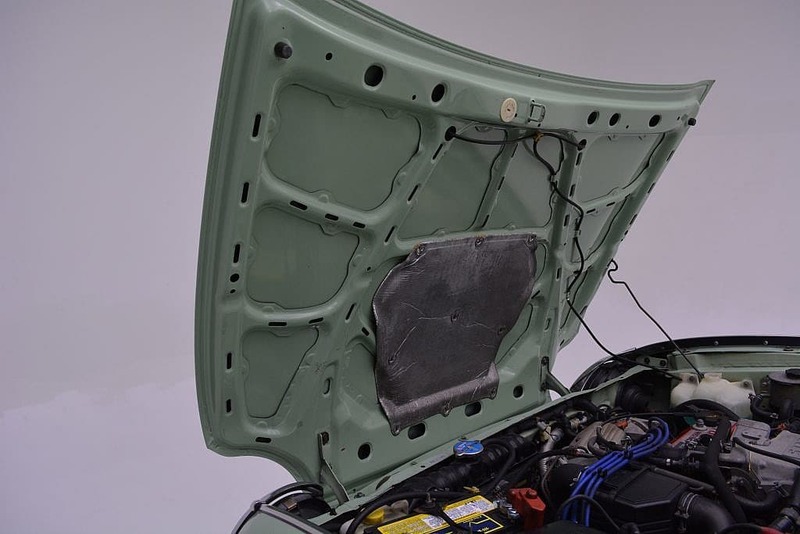 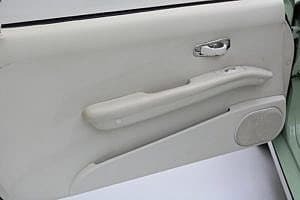 The leather seating surfaces, nor the door sills, show any excessive wear and are what you would expect to see in a car with only 40k miles. The U.K. has been buying these up in droves for many years given the relevant right-hand drive setup. 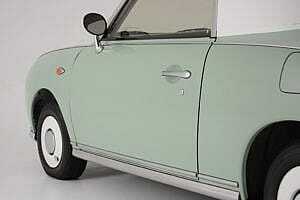 Also importation rules there make it much easier to fill the grey market. 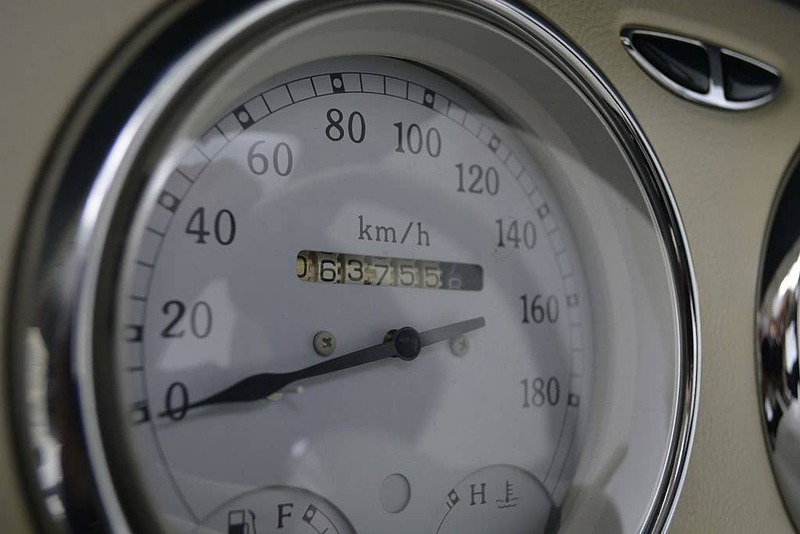 In the U.S. however, the EPA places ruling on cars, stating that a car must be at least 25 years old before legally available for import. Now that these little guys are aging into that rule, we are starting to see some flow into the market and already developing a huge following. 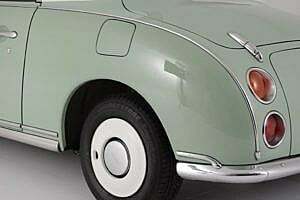 Good examples like this one should appreciate due to the unique history, appeal and limited production. 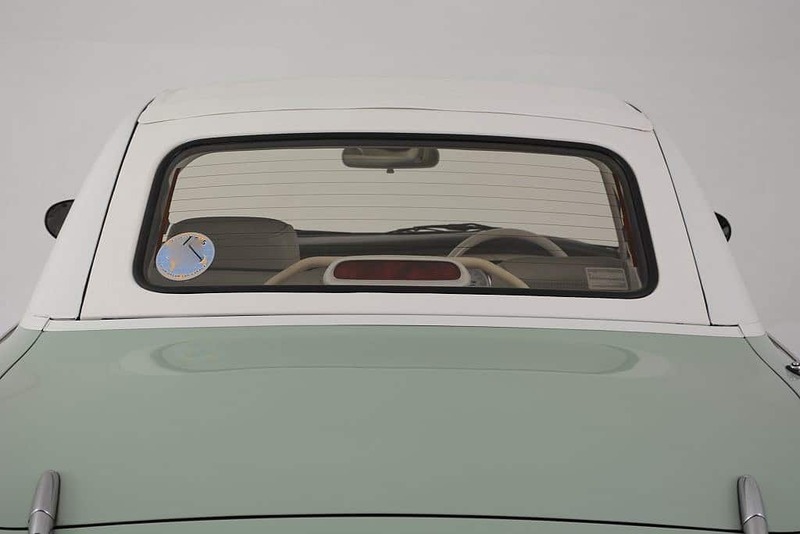 And here’s something new at Second Daily…ready for it? 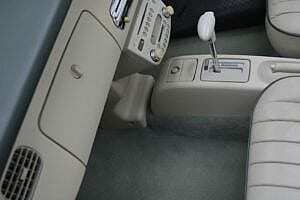 Financing is available to qualified buyers through the seller. 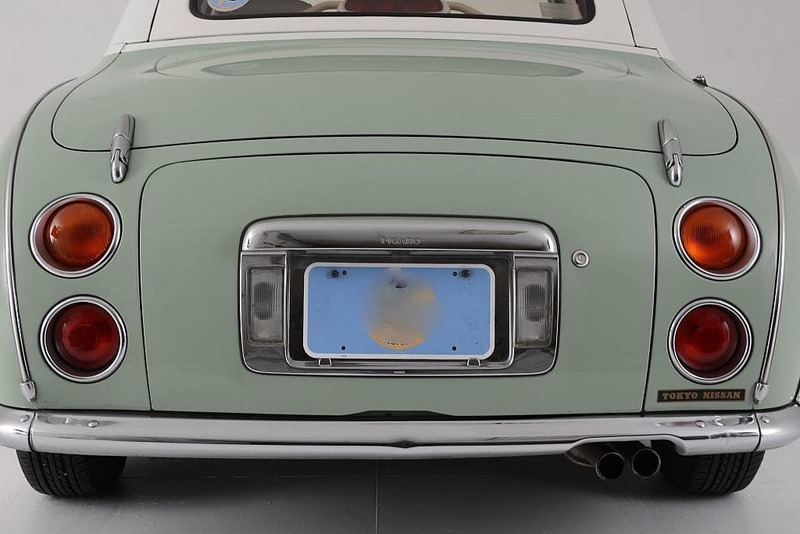 What are the weird photo smudges on both front fenders? Hi John, You beat me to the Exterior description…those are just reflections in the paint. 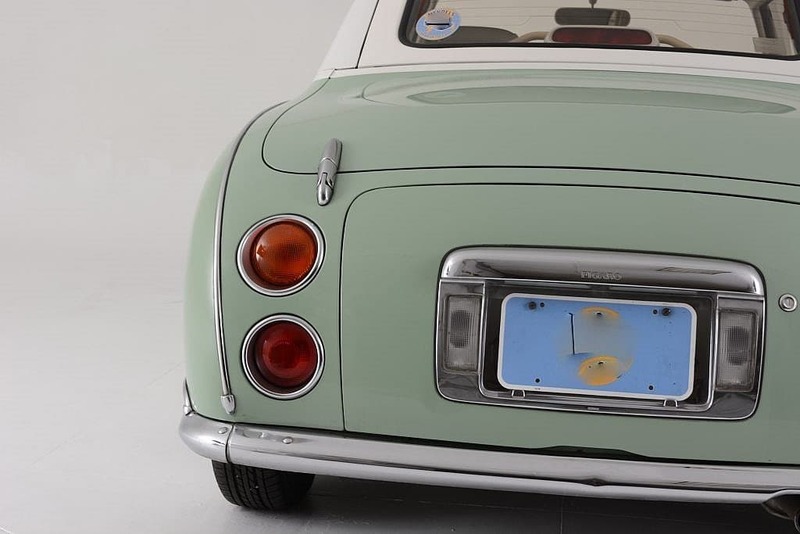 In one picture, you can actually see the photographers light stand 🙂 We have about 50+ photos that we will be loading tomorrow.